Business challenges for pharma have been changing dynamically over the decade. From a period emphasising blockbuster drugs to serve mass markets – we call it “pharma 1.0” – the industry moved into a “pharma 2.0” phase, which abandoned this narrow focus in favour of a more diversified business strategy. Diversification was pursued in terms of new products such as: NCEs/NBEs and generics side by side; geographically, by discovering the opportunities of emerging markets; and also in terms of business fields such as animal health and nutrition complementing the pharmaceutical core business. A huge consumer market with increasing spending power, unmet medical need in western-style chronic diseases, increased government spending on healthcare and an aspiring local pharmaceutical industry are all reasons why western pharmaceutical companies cannot afford to ignore China and India. Hurdles do remain in the form of IP protection and threat of compulsory licensing, changing regulatory pathways and government priorities. Do You Have the Skill & Knowledge to Do Your BD&L Job Successfully? The importance of the business development and licensing (BD&L) function in the global biopharmaceutical industry is described in a recent article in the Journal of Commercial Biotechnology. BD&L has grown significantly over the past 20 years as pharmaceutical companies have sought to supplement their internal R&D with innovative products and technologies sourced from biotechnology and drug delivery companies. With economic and political stability evident now for several years, Latin America is a highly attractive option for companies looking to expand into new and emerging markets. There are certainly challenges to understand and overcome, but the opportunities are there for growth. How Much Can We Count on the US for Future New Products? The pharmaceutical industry has over many years relied on the ability of the US to generate a good proportion of the new products reaching global markets. But its track record over the past decade has been more patchy. What can we expect in future from the US? During the last decade the pharmaceutical and biotechnology industries have witnessed the emergence of many new companies that were originated within established corporations. These new entities have been termed “spin-outs”. How Do We Recognise the End of the Road for a Partnering Campaign? The pharmaceutical business development (BD) world tends to be a positive and constructive environment where, within reason, all things are possible and the overriding theory is that if the partnering strategy and valuation are right then all assets are, in principle, partnerable. Therefore the concept of “nonpartnerability” is a difficult one to recognise. This is particularly the case for a biotech company that has been extolling the virtues of its technology to its investors for many years during early development. Patient-centric formulations and dosage forms have great utility and appeal to a range of target patient populations. They may also improve the market value of the product especially when drug formulation technologies are considered throughout the drug development process. Drug delivery customisation can be utilised to address the needs of certain patient subpopulations, such as paediatrics, geriatrics, dysphagia patients, adolescents, and patients with mental illness, to support compliance, disease management and improved outcomes. The month of July saw huge deal activity, as if everyone was trying to close their deals before the holiday season! Of the deals highlighted in this month’s Deal Watch table, nine of them were announced in the last three days of the month. And some of these were big ticket items: Elan’s $8.6 billion acquisition by Perrigo, Cubist’s $1.6 billion double buying spree in the antibiotic area and AstraZeneca’s $815 million deal with FibroGen for an oral drug to treat anaemia in renal disease. The appetite for acquisition shows no decline and nine of the 22 deals in this month’s table are acquisitions of the whole or part of a company; in addition there is Celgene’s option to acquire Acetylon Pharmaceuticals. 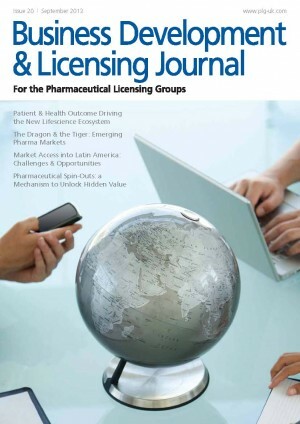 This issue of the PLG’s journal complements the International Pharma Licensing Symposium (IPLS), the eleventh such conference, being held in Dublin. Some of the topics in this copy are based around the IPLS presentations and cover various subjects including emerging markets. Emerging markets have been feted as being the bright hope for the industry but there are concerns on issues such as quality and IP. To some extent these concerns have been validated as in China we have seen senior executives from several major companies under investigation for fraudulent practices in their business operations. This appears to be a market issue rather than a single rogue company. failed to comply with local regulations following a post-grant challenge. This was not an isolated case, as the salt form of lapatinib, (the active in GlaxoSmithKline’s Tykerb for breast cancer) was revoked and a patent for a new version of Novartis’ Glivec (imatinib) was rejected for lack of novelty. Other products in the IP firing line include Roche’s Pegasys (peginterferon alfa-2a) and Pfizer’s Sutent (sunitinib). So, do we look to the established markets? We have an article on the US which addresses this very point. This issue also coincides with the first award of an MSc degree in Pharmaceutical Business Development & Licensing from Manchester University. This is no small achievement, completing eight individual modules plus a project requires hard work and dedication! Again, one of our articles includes a review of the benefits of training.